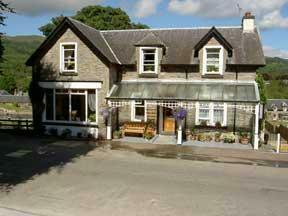 The Caledonian Bed and Breakfast takes in the famous five locks of the Caledonian Canal. Within easy walking distance of Fort Augustus and practical for exploring the Great Glen Way. This large bed and breakfast dates back to the mid-Victorian Period and enjoys a great location for Loch Ness and the islands of Syke, Mull, Iona and Rhum. Cruise Loch Ness is just around the corner and offers a good range of tours and trips up and down the Monster Scottish Loch. The five non-smoking bedrooms are a capable mix of doubles, twins and superior ensuite doubles. Each features Flat Screen TV, DVD Player, Freeview TV and free wirless broadband. The Superior room also features the original pine features of the old Caledonian House. There are heaps of outdoor activities and some stunning views for walkers. Caledonian House offers fishing trips and mountain-bike hire.